Fully updated with new topics covering the latest developments and debates, the second edition of this highly influential text retains its unique combination of accessibility and originality. Features five new topics that bring readers up to speed on some of the latest developments in the field, and give them a glimpse of where it's headed: Should knowledge come first? Do practical matters affect whether you know? Is virtuous motivation essential to knowing? Can knowledge be lucky? Can evidence be permissive? Substantially updates two other debates: Is there immediate justification? Can belief be justified through coherence alone? Matthias Steup is Professor of Philosophy at Purdue University, USA, where he is head of the Department of Philosophy. A specialist in epistemology, he is a widely published author and editor. 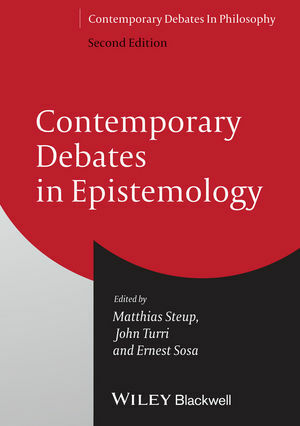 Previous work includes A Companion to Epistemology (co-edited with Jonathan Dancy and Ernest Sosa, Wiley-Blackwell, 2010, second edition), the first edition of Contemporary Debates in Epistemology (co-edited with Ernest Sosa, Wiley-Blackwell, 2005), and Knowledge, Truth and Duty (2001). John Turri is Assistant Professor of Philosophy at the University of Waterloo, Canada. A specialist in epistemology and the philosophy of language, he has published dozens of articles on these topics in leading journals such as Philosophical Review, Noûs, Philosophy and Phenomenological Research, Analysis, and Philosophical Studies. He currently holds an Early Researcher Award from the Ontario Ministry of Economic Development and Innovation. Ernest Sosa is Board of Governors Professor of Philosophy at Rutgers University, USA. He has published books and articles in epistemology, including Knowledge in Perspective (1991), Epistemic Justification (with Laurence BonJour, Blackwell, 2003), A Virtue Epistemology (2007), Reflective Knowledge (2009), and Knowing Full Well (2011).